Peter Walter, PhD, professor of biochemistry and biophysics at UC San Francisco, has been named winner of a 2018 Breakthrough Prize in Life Sciences, for his research on a biological mechanism that normally protects cells, but can cause disease if not functioning properly. Walter, 62, was recognized for “elucidating the unfolded protein response, a cellular quality-control system that detects disease-causing unfolded proteins and directs cells to take corrective measures,” according to the award citation. Kazutoshi Mori, PhD, a leading researcher at Kyoto University in Japan who has shared many major scientific awards with Walter, also received a 2018 Breakthrough Prize for his work on the unfolded protein response. Peter Walter (right), PhD, and Kazutoshi Mori, PhD, receive their 2018 Breakthrough Prize in Life Sciences during an awards ceremony Sunday night. 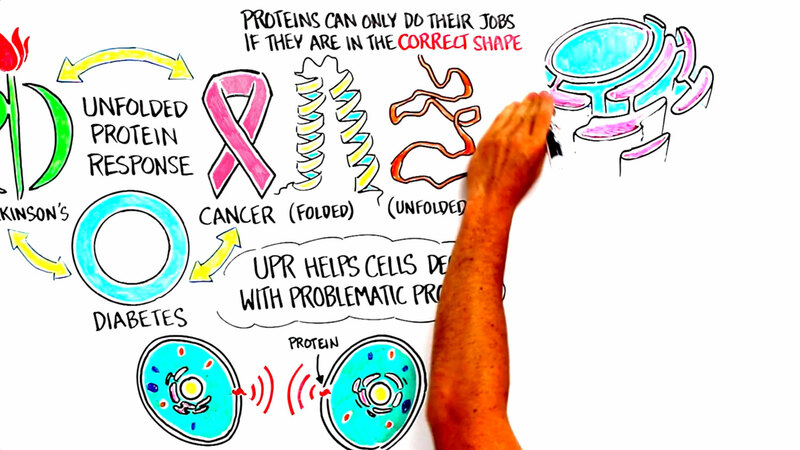 Watch a video explainer, "What is the Unfolded Protein Response?"